These are so cute and easy! To add some hand stitched fabulousness to any gift, make a few of these in just a few minutes. For a smaller, less loopy bow, chain 30. For a larger, more loopy bow (like the red one), chain 50. Making the bow is super simple! Just make a small loop...don't make the loops too big or it will be floppy and saggy looking. Smaller loops are a little sturdier and "fluffy" looking. Make a second loop. It will kind of look like a figure 8. Now keep repeating until you have several figure eights...I got about 4 on each side with 30 chains long. For the red bow that is 50 chains long, I got about 5 loops on each side. With a length of yarn about 10-12 inches long, tie the loops in the middle, making sure you tie it as tightly as you can. Now you can secure it to a gift! You can use the tails to tie it on or you can snip the tails short and just tape it right on...cute! Thank you for this cute little beauties!!! Hello there. I just wanted to Thank You so much for designing the Granny Stocking which was recently showcased on Tangled Happy. I have a new Grandson,William andI wanted to make him an extra special stocking for his first Christmas and your pattern set my hook a whirling. It was just what i wanted and I am thrilled with it. I doubled it in size as I think Grandma,'s are allowed to do a little bit of spoiling at Christmastime. So cute! I checked it out and it absolutely lovely!!! Jennifer, these are just perfect. 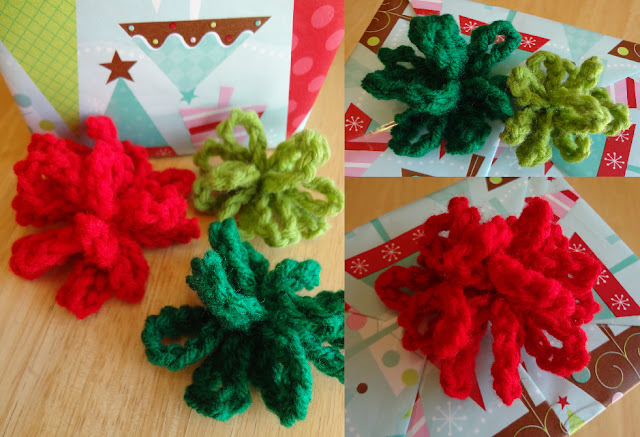 I made some pom poms too, love putting hand made touches on gifts! Eeeeek, Jennifer! This is wonderful! I have been making bows by chaining close to 60 and then going back over it with a sc. I tie a bow and voila! These give more of a feel of a "Christmas bow". So much fun! Thank you for sharing! Great idea...I love it! I will definitely have to try that...thanks so much for sharing!